Do you love music with a passion but unfortunately music does not seem to love you back all that much? There are countless people who would give an arm and a leg to be able to play the guitar like Jimi Hendrix, Stevie Ray Vaughn, Joe Satriani, Steve Vai, and the rest of the guitar legends. Others would love it dearly to be able to play the piano. Whatever instrument it is that you dream about, there just might be hope for you. Researchers in Japan have come up with a device that is supposed to teach people how to play a musical instrument by taking control of the hands. Yes, you read that right. Dubbed PossessedHand, the device works by taking over the user’s hands, and in the process, teach the person how to play a specific instrument. In spite of the name, the device does not involve spirits or possession, which I suppose many people might appreciate. Back to reality, though, the PossessedHand works by stimulating the muscles in the forearms with electricity. These muscles are the ones responsible for moving our fingers. So if you were to wear the device, your hand would look something like this. If you think that is a little freaky, then get ready for this: your hands will move on their own, without your brain telling them to. 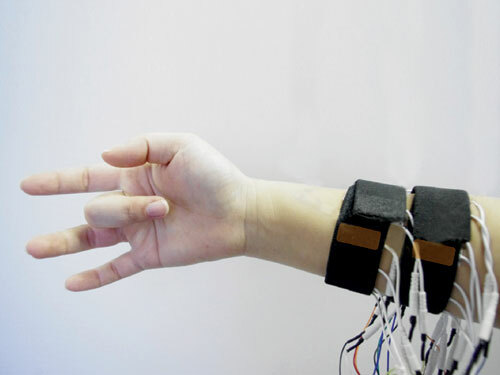 That’s how the electric impulses work – they control your fingers so that you can play a musical instrument even if your brain doesn’t understand how to. Can you imagine just how freaky that would be? Parts of your body moving without you controlling them. As of now, the device is meant to help budding musicians learn (faster?). It is also meant to help those in need of rehabilitation. All I can say is that freakish or not, this device would be a welcome thing to play with. I do have this feeling that no device can replace musical talent, though. Still, a girl can try, can’t she? Check out PossessedHands in action.